So we've recently developed an addiction to Wold, aka the Black Metal outsiders from Saskatchewan, Canada, based on Stephen O'Malley's reissue of their indomitable 'Freemasonry' album and consecutive nights spent holed up with all their music we could find on th'internet. We just got hold of some of their stock from the legendary Profound Lore label and this is one of them: 'Working Together For Our Privacy' was recorded in 2010 and revolves three tracks of excoriating, unheimlich sturm und drang flung far, far from the norm. In our admittedly limited knowledge of the genre, we've never heard anything quite like it, but are assured by some certified heads in the know that even within this extreme rhizome, simply nobody sounds quite like these guys. 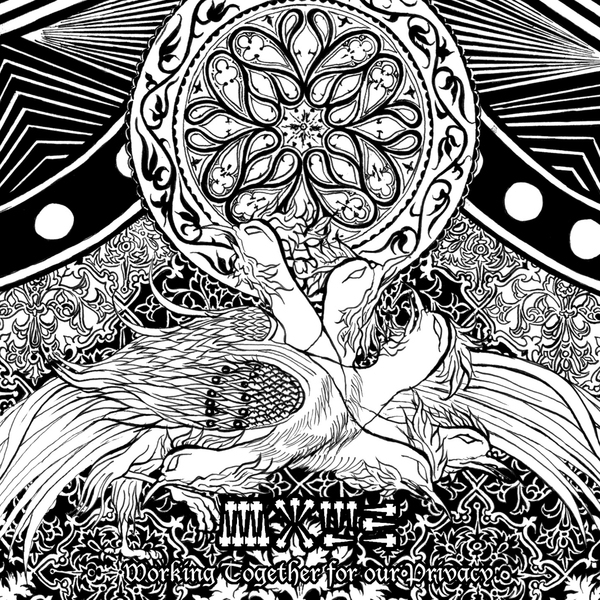 For us, their blend of howling infernal harmonics and bludgeoned, blood-spitting drum machine roil has the psychoactive intensity of Merzbow, and the tantric suspense of Daniel Menche; yearning for the abyss with unrepentant, prurient fervour that's at once overwhelming and deeply, cathartically gratifying. With these three tracks we're privy to the most isolated, wretched - and, by turns, life-affirming - edge-of-the-earth perspective imaginable, and it's not an opportunity to be treated lightly. Massive recommendation.